[142 Pages Report] Data fusion is the process of integrating data from multiple, disparate data sources to produce accurate, consistent, and more useful information than provided by an individual data source. It seamlessly detects and combines the data to generate improved information and extract new knowledge that could be shared with the authorized users for better decision-making. Data fusion is a collection of multiple big data sources, which delivers a comprehensive view of customer and business data across an organization. The data fusion market size is expected to grow from USD 6.75 Billion in 2016 to USD 15.92 Billion by 2022, at a Compound Annual Growth Rate (CAGR) of 15.9% during the forecast period. The year 2016 is considered as the base year, while the forecast period is considered from 2017 to 2022. The objective of the report is to define, describe, and forecast the data fusion market trends based on component, business function, deployment model, organization size, industry, and region. The objective is to provide detailed information related to the major factors influencing the market growth, such as drivers, restraints, opportunities, and challenges. The data fusion ecosystem comprises vendors, such as AGT International(Switzerland), Esri (US), LexisNexis (US), Palantir Technologies (US), Thomson Reuters (Canada), InvenSense (US), Clarivate Analytics (US), Cogint (US), Merrick & Company (US), and INRIX (US). The other stakeholders of the data fusion market include data fusion tools providers, analytics service providers, consulting service providers, IT service providers, resellers, enterprise users, and technology providers. The study answers several questions for the stakeholders; primarily, which market segments to focus in the next 2 to 5 years for prioritizing the efforts and investments. 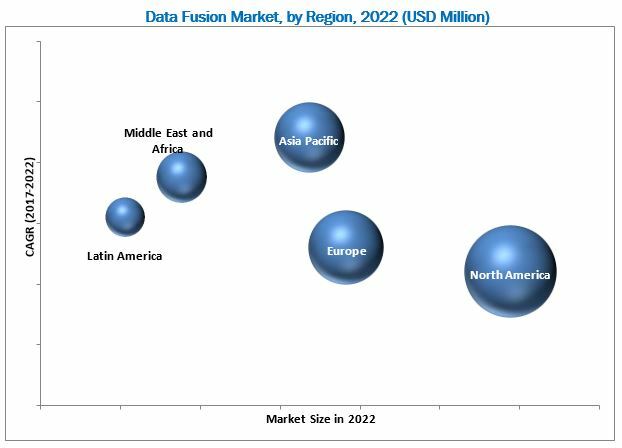 The data fusion market size is expected to grow from USD 7.62 Billion in 2017 to USD 15.92 Billion by 2022, at a Compound Annual Growth Rate (CAGR) of 15.9% during the forecast period. The major growth drivers of the market include rapid adoption of data-driven decision-making and introduction of Industrial Internet of Things (IIoT). The Banking, Financial Services, and Insurance (BFSI) industry vertical is expected to account for the largest share of the data fusion market in 2017. The growth is fueled by the growth in need of people to simplify their workload related to security and increase in dependence on data generated from various IT systems used for financial transactions. The media and entertainment industry vertical is projected to grow at the highest CAGR during the forecast period due to the increase in need to manage data extracted from various sources and other IT systems, such as operations management. The major business functions, which the data fusion caters to are Information Technology (IT), sales and marketing, finance, operations, and Human Resources (HR). The adoption of data fusion for HR business function is expected to increase significantly in the forthcoming years, owing to the surge in need to resolve HR process-related issues in real time and rise in requirement to streamline operations across industries. Several organizations have rapidly deployed data fusion tools either on- premises or on-demand. The demand for on-demand or cloud-based data fusion tools has increased due to its cost-effective and time-efficient features. On-demand data fusion tools’ growth is specifically high in Small and Medium-sized Enterprises (SMEs), where low-cost solutions are much required. 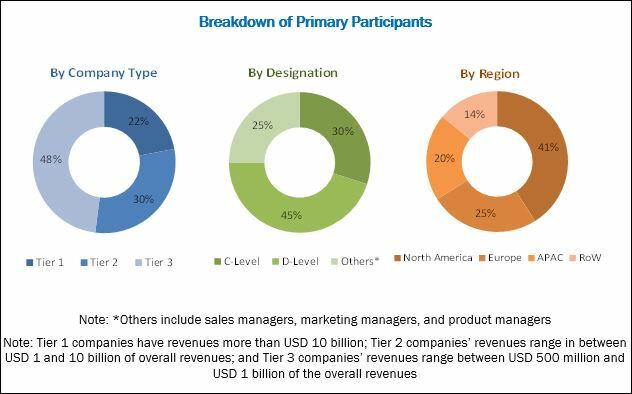 The global market is segmented based on regions into North America, Asia Pacific (APAC), Europe, Middle East and Africa (MEA), and Latin America to provide a region-specific analysis in the report. Further, followed by Europe, North America is expected to continue being the largest revenue generating region for data fusion vendors in the next 5 years. This is mainly because in the developed economies of the US and Canada, there is a high focus on innovations obtained from Research and Development (R&D) and technology. The APAC region is expected to be the fastest-growing region in the data fusion market, owing to the increase in adoption of Internet of Things (IoT) and smart technologies, and various government initiatives, such as smart cities across APAC countries, including China and India. The data fusion market faces challenges, such as management and maintenance of the data quality and dearth of skilled workforce. Furthermore, high-investment costs and varying structure of regulatory policies are expected to limit the market growth. The major vendors that offer data fusion tools and services globally are AGT International (Switzerland), Esri (US), LexisNexis (US), Palantir Technologies (US), Thomson Reuters (Canada), InvenSense (US), Clarivate Analytics (US), Cogint (US), Merrick & Company (US), and INRIX (US). These vendors have adopted different types of organic and inorganic growth strategies, such as new product launches, partnerships and collaborations, and mergers and acquisitions to expand their offerings in the data fusion market.